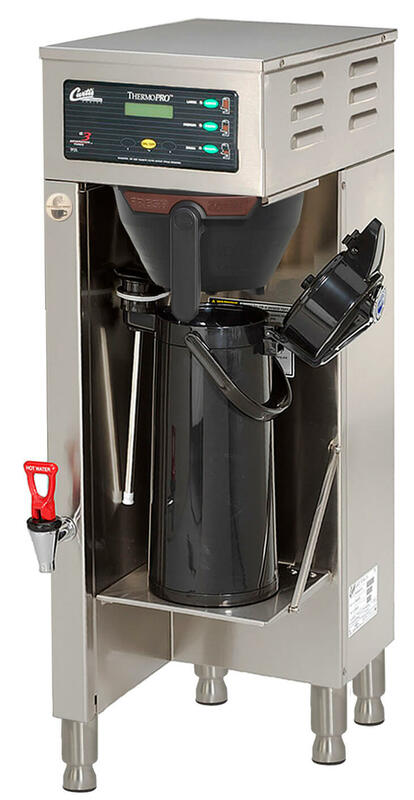 Curtis G3 Technology combines precision brewing capability with an easy-to-use interface. All brewing functions are displayed in real time, not a coded system of indicators. Curtis ThermoPro systems are factory set for out-of-the-box operation with pre-programmed recipes that ensure a consistent brew, every time. And with scroll-through menus, it’s just as easy to fine-tune the brewing process for your exacting gourmet coffee profile. G4 Technology with IntelliFresh® delivers advancements to make brewing and dispensing of hot, fresh, gourmet coffee and tea even easier. Its simple, intuitive, icon-driven interface includes features that simplify brewing operations, provide fast and intuitive training and reduce service calls and cost. At the center of the new G3 system is its unique Universal Control Module – UCM. This brewing “brain” is completely encapsulated in a high-tech polymer case, protecting it from harmful heat, moisture and impact which could damage earlier systems. Just supply a level counter, power and water, and you’re ready to brew. The Curtis G3 Airpot System PLUS your gourmet roast provides luxurious flavor with brewing simplicity…every time. With the Curtis G3 Coffee Brewing System there’s no need for complex brewing adjustments, unless you want them. With simple “scroll-through” programming on an oversized LCD display you can effortlessly offer customers gourmet taste, without any fuss. Easily set the brewer to your exacting standards, or use the Curtis’ factory settings to deliver ideal results.